Why is this a good time to invest in Sarasota Real Estate? Saturday, September 24th, 2011 at 12:02pm. 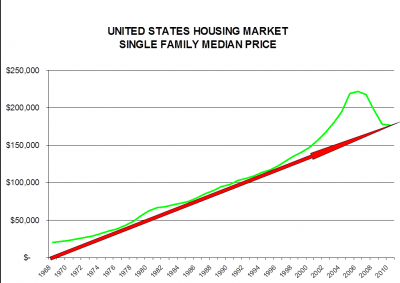 I know – just like so many people were convinced during the boom that housing prices would continue to appreciate at 30 – 40% a year forever, many are convinced that the downward trend will continue too. But take a look at the 40 years of history in these 2 graphs and I think logic will tell you otherwise. We can always look in the rear view mirror and say “that’s when I should have bought or sold an asset”. Savvy investors know the best way to time an asset sale or purchase is to look at trends.